World Showcase is the true heart of Epcot, and the Mexico Pavilion is one of World Showcase's most stunning countries. Fronted by a giant facade that resembles an Aztec temple, the entire experience is housed inside. A small museum of Mexican culture and history provides the entry into the greater pavilion, a perpetually moonlit courtyard buzzing with life. Street vendors sell numerous wares, nearby stores entice customers with pricier goods, and a tequila bar tempts the thirsty. A romantic restaurant sits along the water that flows past another ancient temple, with a volcano looming in the distance. Hidden in the back of the pavilion is one of World Showcase's only two rides, three if you count transportation boats. The Gran Fiesta Tour Starring the Three Caballeros has one of the longest names of any Disney attraction, but that's not the only thing that makes it unique. This is a dark ride, tourism film, and animated adventure all viewed from a slow moving boat. It's not the best or most exciting ride, but it's one of the most random. This attraction started life as The Gran Fiesta Tour, supposedly a journey through Mexico's past and present. Blending detailed scenery with video screens, as well as a room that feels like an it's a small world homage, the ride felt more like an advertisement for a vacation in Mexico than an actual look at its culture and people. The ride had limited popularity, due to its rapidly dated feeling videos and hidden location. Hoping to revamp the attraction, Disney introduced a new plotline centered on The Three Caballeros, stars of some of Disney's most disjointed and surreal features. As the thin story goes, Brazilian parrot Jose Carioca and Mexican rooster Panchito Pistoles journey through Mexico to find their partner Donald Duck and make it to their concert in time. Along the way, they pass through scenes of the country's sights and highlights. Other than the videos, little of the attraction changed. There does seem to be an increase in visitors, however, attracted by the promise of an adventure with Donald and friends. Seeing the confused reactions of some guests afterward is one of the pleasures of the ride. Entering through an awning next to the pavilion's river, guests descend a short, twisting queue to their boats. Drifting calmly into the waters, they pass diners at the San Angel Inn on their right before entering ancient ruins on their left. At the end of a long, mural lined tunnel, a giant screen comes to life, as Panchito and Jose discover their friend and bandmate Donald has disappeared. Floating past more screens and temple scenery, they pass the birds as they continue their search on a flying serape, always managing to miss the sightseeing Donald. Suddenly, the boat enters a town square celebrating Day of the Dead. Animated papier-mache dolls dance and smash pinatas as a skeletal band plays from above. Leaving the town behind, guests pass by a busy restaurant and an ocean grotto, before finally discovering Donald at a Mexican fiesta. 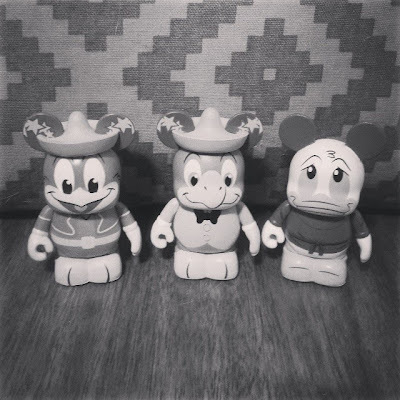 Re-united with his compatriots, the Three Caballeros appear on stage in Mexico City, playing their signature tune for passing boats. Finished with their journey, riders receive a final farewell from the birds before unloading at the dock. The main problem found within the Gran Fiesta Tour is a common issue at Epcot, alcohol. Mexico Pavilion is the last stop on many Drink Around the World Tours, and there's a high-class tequila bar across the square. Guests who have imbibed too much will wander to the boat ride, though their wandering may not be a very straight path. Their obnoxious commentary and loud voices can unnerve even the most patient guests, not to mention their booze soaked breath that could knock a burro unconscious. Another odd annoyance comes from the close quarters of the attraction. Many scenes are within arms reach of guests, and the lighting is often dark enough to obscure guest's bad behavior. As such, an occasional bold rider will reach into the attraction and steal theming, such as fake flowers lining one section. It can only be hoped these individuals escalate their crimes, so that they can be ejected for shoplifting and leave the rest of us to our law abiding attraction going. The Gran Fiesta Tour Starring the Three Caballeros is an entertaining diversion, a slow moving dark ride with pleasant, if low-tech scenery. The room of animated dolls shows some great art and design, as do the majority of the sets. While it doesn't match the true beauty of Mexico's greatest sights, it still gives a decent tourist's view of the country while providing some Disney charm for the kids. As long as the tequila tours are avoided, it's a relaxing way to spend a few minutes in World Showcase.